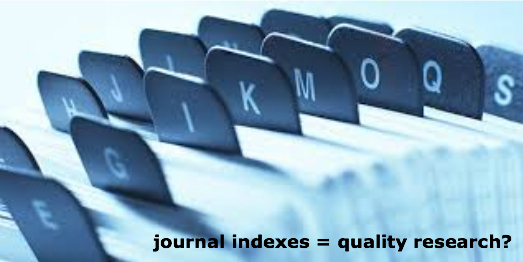 I wonder about the contribution of journal indexes / databases to the assessment of research quality. Lately, and against what would be logical given the major changes being experienced by the publishing industry, professors are increasingly required to publish in journals indexed in Journal Citation Reports (JCR), both statewide for accreditation as at universities, especially in private ones. This adds pressure to scholars and journals alike, because the journals indexed there are numbered. Moreover, there are other relevant indexes that serve the same function of research assessment: generalists, such as Scopus, EBSCOHost or DOAJ; regionals, like Latindex or Indian Science Abstract; or specialists, such as Econlit, Medline or BioAbstracts. Being in JCR, journals have to demonstrate to be a regular publication, printed in English, have an international editorial board and other requirements that have little to do with the quality of the papers within. Having a journal indexed in Scopus and other known ones, it is enough to filling out a form giving them permission to use the journal data. Following the same line, other similar indexes (generalists, regional or specialists), only require an application form to be filled. Quality of authors and papers. Sound peer reviewer processes, with good reviewers and feedback. Good Editorial board and clear editorial line, objectives, etc. If that is somehow true, then, what makes the difference with un-indexed peer review journals? I have not it very clear, it looks like a kind of complex corporate governance system for journals: different publishing stakeholders (indexes, journals, professors, researchers, universities, departments, accreditation bodies, governments, readers, peer reviewers, editors, journal owners, etc.) taking care of research prestige and reputation. Many voices in academia call for a change, but, is there a better system than journal indexes and impact indicators to assess quality of research? 1) To allow previous pre-publication always, for fast divulgating the work and registering priority. 2) To have a forum to register all claimed bad actions from journals (refusing with only one reviewer’s opinion, refusing with non-certain arguments, unnecessary requirements being added, and so on. 3) To have a board of experts to be paid to give another opinion on the paper. As many as can be found or paid. 4) To allow to publish a paper indicating which journals had previously rejected it. There’s more of this with respect to eLife – they never even applied and they are in the Index Medicus.